The various Army Chiefs of Staff issued six different professional development reading lists between 2009 and 2017 (Casey I, Casey II, Dempsey I, Odierno I, Odierno II and Milley I). All these lists are completely different — Dempsey’s brief list consists of 26 books while Milley’s massive list clocks in at a staggering 115 books. These six reading lists cumulatively contain the names of 240 different books, yet not a single one shows up on every list and only one book (Makers of Modern Strategy 2nd ed.) shows up on five of the six lists. In fact, 80 percent of the books on the most recent list are not mentioned on any of the previous lists. In the 2017 reading list, Gen. Milley wanted to focus attention on George Marshall. Great idea. Marshall is a wonderful model of military professionalism. Unfortunately, the reading list directs people to Forrest Pogue’s four-volume (!) biography of Marshall. I read all four volumes this summer and it was painful. What is odd about this choice is that the Army has a perfectly good 95-page monograph on Marshall and strategic leadership (written by an Army colonel at the Strategic Studies Institute of the Army War College in 1993) that would serve the same purpose. Guess which conflict makes Army generals more comfortable World War II (14 books) or Vietnam (1 book)? There is an entire field of human thought devoted to planning, organizing, leading and controlling organizations. It is called the field of management. As an academic major, management is the most popular in American universities (and coincidentally, the most popular academic major, by far, among cadets at West Point). One would think that people who are responsible for planning, organizing, leading and controlling one of the largest organizations on Earth would be at least a little interested in the field of management. The 2017 reading list shows otherwise. Despite containing 115 books, not a single one of these books is from the field of management. Michael Porter, anyone? Clayton Christensen? Jim Collins? Bueller? I would make time to read that book. The typical firm had three employees and profits of 94,512 CFA francs ($173) a month. Only about a third kept books, and less than one in 20 had a written budget. As they report in Science, the researchers split the businesses into three groups of 500. One group served as the control. Another received a conventional business training in subjects such as accounting and financial management, marketing and human resources. They were also given tips on how to formalise a business. The syllabus came from a course called Business Edge, developed by the International Finance Corporation. The final group was given a course inspired by psychological research, designed to teach personal initiative — things like setting goals, dealing with feedback and persistence in the face of setbacks, all of which are thought to be useful traits in a business owner. The researchers then followed their subjects’ fortunes for the next two-and-a-half years (the experiment began in 2014). An earlier, smaller trial in Uganda had suggested that the psychological training was likely to work well. It did: monthly sales rose by 17% compared with the control group, while profits were up by 30%. It also boosted innovation: recipients came up with more new products than the control group. That suggests that entrepreneurship, or at least some mental habits useful for it, can indeed be taught. More surprising was how poorly the conventional training performed: as far as the researchers could tell, it had no effect at all. To arrive at the final grades, I’d carefully marked all the assignments and used a standard point scale and the prescribed weighting of each part of the coursework. I had given only one A in the class. The complaining student was smart, but on the evidence, he had been coasting; at an ordinary institution, he would have earned a C, not an A-minus. but Harvard undergraduate courses aren’t set up that way. All this had misled me as to what I should expect when teaching at Harvard. This professor didn’t ask to see any evidence. He accepted the student’s plea that he had “worked really hard.” Then, in front of the student, he pressed me to explain the reason for my poor teaching, apparently the only thing that could reveal why the student wasn’t satisfied with his grade. Once he extracted my synthetic mea culpa, the professor happily raised the grade. The triumphant student left, and the professor praised me for my professional behavior. That is half true. The missile did not pose a serious threat. It flew over the Japanese island of Hokkaido, landing 3700 km (2300 miles) from its launch point near North Korea’s capital of Pyongyang. The key word here is “over.” Like way over. Like 770 kilometers (475 miles) over Japan at the apogee of its flight path. Neither Japan nor the United States could have intercepted the missile. None of the theater ballistic missile defense weapons in existence can reach that high. It is hundreds of kilometers too high for the Aegis interceptors deployed on Navy ships off Japan. Even higher for the THAAD systems in South Korea and Guam. Way too high for the Patriot systems in Japan, which engage largely within the atmosphere. All of these are basically designed to hit a missile in the post-mid-course or terminal phase, when it is on its way down, coming more or less straight at the defending system. Patriot is meant to protect relatively small areas such as ports or air bases; THAAD defends a larger area; the advanced Aegis system theoretically could defend thousands of square kilometers. But could we intercept before the missile climbed that high? There is almost no chance of hitting a North Korean missile on its way up unless an Aegis ship was deployed very close to the launch point, perhaps in North Korean waters. Even then, it would have to chase the missile, a race it is unlikely to win. In the only one or two minutes of warning time any system would have, the probability of a successful engagement drops close to zero. If North Korea cooperated and shot their new intercontinental ballistic missile, the Hwasong-14, at the United States with adequate warning so that we could prepare, and if the warhead looked pretty much like we expect it to look, and if they only shot one, and if they did not try to spoof the defense with decoys that looked like the warhead, or block the defense with low-power jammers, or hide the warhead in a cloud of chaff, or blind the defense by attacking the vulnerable radars, then, maybe this is true. The United States might have a 50-50 chance of hitting such a missile. If we had time to fire four or five interceptors, then the odds could go up. Our anti-missile systems have never been realistically tested against any of these simple countermeasures. It’ll take you about 1,500 hours (or 62 days) to complete a full play of The Campaign For North Africa. The game itself covers the famous WWII operations in Libya and Egypt between 1940 and 1943. Along with the opaque rulebook, the box includes 1,600 cardboard chits, a few dozen charts tabulating damage, morale, and mechanical failure, and a swaddling 10-foot long map that brings the Sahara to your kitchen table. You’ll need to recruit 10 total players, (five Allied, five Axis,) who will each lord over a specialized division. The Front-line and Air Commanders will issue orders to the troops in battle, the Rear and Logistics Commanders will ferry supplies to the combat areas, and lastly, a Commander-in-Chief will be responsible for all macro strategic decisions over the course of the conflict. If you and your group meets for three hours at a time, twice a month, you’d wrap up the campaign in about 20 years. This is transparently absurd. Richard Berg knew it himself. He’s designed hundreds of war-games, focusing on everything from The Battle of Gettysburg to the Golden Age of Piracy, and The Campaign For North Africa was an outlier from the start. It was intended to be a collaborative mega-project for all of the wargaming experts employed by the storied, (and now defunct) imprint Simulations Publications Inc. Initially, all Berg was responsible for was the map. Six months later, after the other designers had dropped out, SPI asked Berg if he was interested in finishing the game by himself. He was, and two years later he delivered history’s most infamous board game. 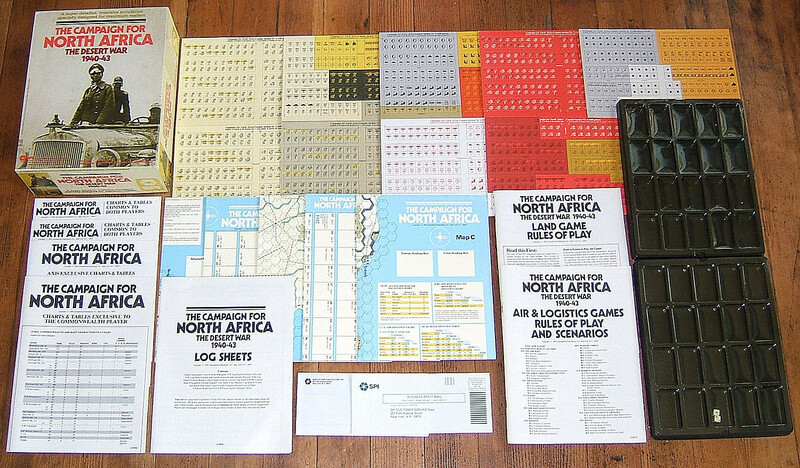 The Campaign For North Africa arrived in the summer of 1979 and sold for $44 in a chunky, four-inch deep box. The game was never a massive commercial or critical success. It harbors a middling 5.8 on community tastemaker BoardGameGeek, and objectively speaking, the systems are exasperatingly finicky and require an eagle-eye for obscure rules and exceptions. In many ways, North Africa is simply a product of its time. The late ‘70s served as the commercial peak for wargaming, with dozens of new designs hitting store shelves every week. The Campaign wasn’t unique, as much as it was a standard archetype blown out to its extremes. Naturally, you do have to pay a premium price for used copies of the game on eBay, but that has more to do with the novelty of owning the “world’s longest board game” than anything else. Joe Rogan interviews Jordan Peterson & Bret Weinstein. Socialism — or the tyranny of the meanest and the most brainless, — that is to say, the superficial, the envious, and the mummers, brought to its zenith, — is, as a matter of fact, the logical conclusion of “modern ideas” and their latent anarchy: but in the genial atmosphere of democratic well-being the capacity for forming resolutions or even for coming to an end at all, is paralysed. Men follow — but no longer their reason. That is why socialism is on the whole a hopelessly bitter affair: and there is nothing more amusing than to observe the discord between the poisonous and desperate faces of present-day socialists — and what wretched and nonsensical feelings does not their style reveal to us! — and the childish lamblike happiness of their hopes and desires. Nevertheless, in many places in Europe, there may be violent hand-to-hand struggles and irruptions on their account: the coming century is likely to be convulsed in more than one spot, and the Paris Commune, which finds defenders and advocates even in Germany, will seem to have but a slight indigestion compared with what is to come. Be this as it may, there will always be too many people of property for socialism ever to signify anything more than an attack of illness: and these people of property are like one man with one faith, “one must possess something in order to be some one.” This, however, is the oldest and most wholesome of all instincts; I should add: “one must desire more than one has in order to become more.” For this is the teaching which life itself preaches to all living things: the morality of Development. To have and to wish to have more, in a word, Growth — that is life itself. In the teaching of socialism “a will to the denial of life” is but poorly concealed: botched men and races they must be who have devised a teaching of this sort. In fact, I even wish a few experiments might be made to show that in socialistic society life denies itself, and itself cuts away its own roots. The earth is big enough and man is still unexhausted enough for a practical lesson of this sort and demonstratio ad absurdum — even if it were accomplished only by a vast expenditure of lives — to seem worth while to me. Still, Socialism, like a restless mole beneath the foundations of a society wallowing in stupidity, will be able to achieve something useful and salutary: it delays “Peace on Earth” and the whole process of character-softening of the democratic herding animal; it forces the European to have an extra supply of intellect, — it also saves Europe awhile from the marasmus femininus which is threatening it. Let me say that a few more times: School is prison. School is prison. School is prison. School is prison. School is prison. Willingham surely knows that school is prison. He can’t help but know it; everyone knows it. But here he writes a whole book entitled “Why Don’t Students Like School,” and not once does he suggest that just possibly they don’t like school because they like freedom, and in school they are not free. Herbert is ecumenical with his borrowing, lifting terminology and rituals from both sides of this obscure Central Asian conflict. When Paul Atreides, Dune’s youthful protagonist, is adopted by a desert tribe whose rituals and feuds bear a marked resemblance to the warrior culture of the Islamic Caucasus, he lives at the exotically named Sietch Tabr. Sietch and tabr are both words for camp borrowed from the Cossacks, the Czarist warrior caste who would become the great Christian antagonists of Shamyl’s Islamic holy warriors. Herbert also lifted two of Dune’s most memorable lines directly from Blanch. While describing the Caucasians’ fondness for swordplay, Blanch writes, “To kill with the point lacked artistry.” In Dune, this becomes “[k]illing with the tip lacks artistry,” advice given to a young Paul Atreides by a loquacious weapons instructor. A Caucasian proverb recorded by Blanch transforms into a common desert aphorism. “Polish comes from the city, wisdom from the hills,” an apt saying for a mountain people, becomes “Polish comes from the cities, wisdom from the desert” in Dune. Dune’s narrative, however, owes more to The Sabres of Paradise than just terminology and customs. The story of a fiercely independent, religiously inspired people resisting an outside power is certainly not unique to the Caucasus, but Blanch’s influence can be found here, too. The name of Herbert’s major villain, Baron Vladimir Harkonnen, is redolent of Russian imperialism. Meanwhile, Imam Shamyl, the charismatic leader of Islamic resistance in the Caucasus, describes the Russian Czar as “Padishah” and his provincial governor as “Siridar,” titles that Herbert would later borrow for Dune’s galactic emperor and his military underlings. There are even some interesting echoes of Blanch’s writing style and tendencies in Herbert’s book. Both authors traffic in evocative descriptions of stark, unforgiving landscapes and equally unforgiving peoples. And their shared tendency to describe their protagonists in raptor-like terms may not be a coincidence. (For Blanch, the Caucasus was a land of “eagle-faced warriors” and Imam Shamyl was possessed of “handsome eagle features.” Naturally, the Atreides are also notable for their “hawk features.”) Even Dune’s colors owe something to Blanch’s history. The banners of House Atreides are green and black. The first is, of course, the color of Islam and the second was adopted by Imam Shamyl’s Murids, holy Islamic warriors pledged to fight Russian imperialism to the death. Science fiction and fantasy have always been syncretic genres. The extravagant world-building that fires the imagination of so many readers would be nearly impossible if authors refused to seek inspiration in our own histories, religious traditions, and myths. Isaac Asimov’s Foundation trilogy was famously inspired by Edward Gibbon’s Decline and Fall of the Roman Empire. J. R. R. Tolkien’s background in medieval languages helped shape the mythology of Middle Earth. Frank Herbert’s Dune is no different, and rediscovering one of the book’s most significant influences is a rewarding experience. At a time when our most popular science fiction sagas have been reduced to cannibalizing themselves, we would do well to celebrate genre pioneers who were more ambitious in their borrowing. In particular, I get a kick out of how mind-blowing a word-processor is, back just before the PC revolution — and how flat-screen TVs are just over the horizon, even then. The group of four strike fighters entered the close air support stack (CAS stack) overhead the JTAC and waited for any requests for strikes when a Russian Su-27 showed up and began loitering high overhead. Mob, who was having issues with his targeting pod, was assigned to keep tabs on the circling Russian fighter while the other pilots continued with their CAS mission. He turned the Super Hornet’s master mode to air-to-air and began tracking the Su-27 and searching the skies around the area for other aircraft. Then another radar track appeared — a fast moving aircraft coming from the south directly towards him. Although Mob figured it was probably a Syrian aircraft, he moved to intercept the target and eventually made a visual identification on what turned out to be a Syrian Air Force Su-22 Fitter swing-wing attack jet — the same type of aircraft used to deliver the gas attack that led to the Tomahawk missile strike a few months earlier. Mob made it clear during the presentation that if the Syrian jet just turned away that would have been great as they had plenty to do in support of ground forces, but that didn’t end up being the case. After identifying the Su-22, Mob got on the radio with an airborne command and control post, an E-3 Sentry, and had them broadcast warnings repeatedly over guard frequency to the Syrian jet. Those radio calls did not result in a change of course by the Syrian pilot. Then Mob “thumped” the Su-22 three times — flying close over the jet’s canopy and popping flares out in front of it before breaking off — to warn him away. That didn’t work either. By then the Su-22 was in striking distance of friendly forces and it began to dive, releasing its weapons in the process, before making a climb out after the attack. Based on the rules of engagement that were briefed to the naval aviators, Mob locked the Su-22 up from behind with an AIM-9X Sidewinder and fired. The missile zipped off the Hornet’s wing rail trailing smoke but quickly disappeared. It wasn’t clear why the missile failed to track the Su-22 or where it had gone. Mob quickly selected an AIM-120 AMRAAM and fired once again. He noted how long it took for the missile to fire off the Super Hornet’s “cheek” station located along the outer edges of its air intakes. Regardless, the missile tracked the Fitter flying just a short distance away and exploded on its backside, pitching it violently to the right and downward. The pilot was clearly seen ejecting from the doomed swing-wing attack jet. The ejection seat passed very close down the right sight of Mob’s canopy. He noted how live-fire training helped him during the engagement because he knew what to expect and quickly rolled away from the explosion instead of flying through it. The Syrian pilot’s chute blossomed, it was white, green, and orange in color and his emergency transmitter beacon began going off over the radio. What’s also worth discussing is the conjecture surrounding the AIM-9X’s failure in this engagement. By the panel’s account it sounded as if the AIM-9X just went stupid/malfunctioned on its own. There was no talk of the Su-22 launching flares, and even if it had, the fact that many military pundits are definitively claiming that the unique infrared signature of Russian-built low-end decoy flares threw the AIM-9X off course is just silly. Missiles fail, especially air-to-air ones. They are complex devices that get battered around under high gravitational forces and slammed down onto carrier decks and runways throughout their lifetime. And yes, it’s possible that under certain parameters weaknesses could exist when it comes to the AIM-9X’s ability to track certain targets that use certain decoys under certain conditions. Then again maybe they don’t. Regardless, that doesn’t mean that is what happened in this instance or that the AIM-9X is somehow a lousy missile because of it. I recently listened to the audio version of Alas, Babylon, the 1959 post-apocalyptic novel, in which a nuclear war gets kicked off by a US pilot’s AIM-9 Sidewinder heat-seeking missile that goes off course and hits an ammunition depot in Syria. Van Allen Plexico interviewed Jerry Pournelle (and Larry Niven) at the recent DragonCon.